Sweeping and mopping on a regular basis will keep floors presentable and help prevent scratches and stains. Intermittent scrubbing with an automatic floor machine is the most efficient way to keep hard floor surfaces in peak condition. Always putting down clean water and picking it back up with built-in vacuum squeegees ensure squeaky clean floors every time. A 20 inch auto-scrubber can clean 23,000 square feet per hour and is ideal for larger floorplans. However, smaller units are available in 15″ and 17″ diameter scrub decks and are more maneuverable in smaller areas. Ultra high-speed buffing plays an important role in maintaining many types of hard flooring materials. On average, these machines are available with 2,000 rpm motors and provide the “glass-like” shine that is sought after by many facility managers. Floor buffers not only make the floors look great, they harden the finish making it more durable. Providing these steps can prolong the need for an aggressive restoration process. Stripping off old worn finish and applying fresh coats of wax is inevitable even with the best maintenance program in place. 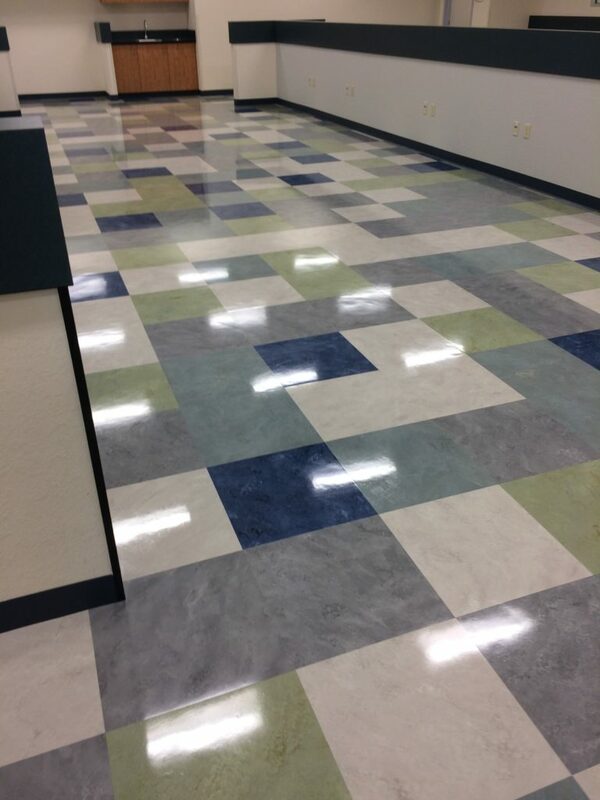 Most commercial floor coverings are highly durable and can withstand high foot traffic and elements brought in from the weather for long periods of time. Under normal conditions, a restoration process is suggested on an annual basis. Some medical facilities and other types of buildings may require semi-annual services. Complete floor care is a smart investment in maintaining beautiful looking floors for the life of the tile. 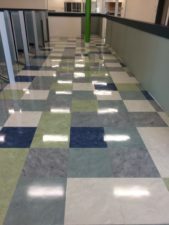 Optimum Cleaning Solutions designs programs for all types and sizes of hard floor surface materials including: VCT, Terrazzo, Linoleum, Quarry Tile, Glazed Ceramic, Concrete, Marble, Slate, and Granite. Contact us for a free quote. While most surfaces get cleaned throughout the year during a regular scheduled maintenance program, an annual spring cleaning is always essential. 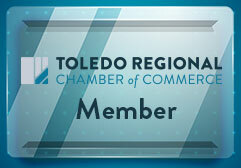 If your company’s office can benefit from a thorough deep cleaning, call OCS today at (419) 206-4520. Start with one window pane at a time to avoid solution drying on the glass. 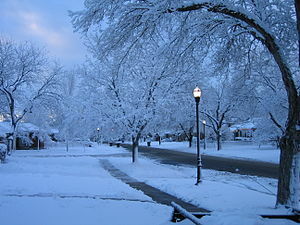 Use a liberal amount of cleaning water for exterior windows. You want the dirt to come off the window with this process. Use the razor blade to remove residue only while the window is wet. Use less water on interior glass by wringing out the scrubber with your hand. This will avoid soaking the ledges, walls, and carpet. You will need to apply slightly more pressure when scrubbing interior windows to compensate for less water being used. If cleaning a lot of windows, be sure to change your cleaning solution once it starts to get dirty. After fully covering the window with cleaning solution, start your squeegee strokes. Horizontal strokes are recommended when possible. Its important to wipe the rubber blade with the lint free towel after each pass. Placing a wet squeegee on the glass will leave streaks. Overlap your strokes and slightly angle the squeegee so water flows towards the wet window surface and not the area that is already dry. There will always be water marks or spots left around the edges of the window pane. After you squeegee the window, wipe clean all edges and corners. This is easier if you can get to the spots before their completely dry. Now you can move on to the next window. The break room or kitchenette in your office is where your employees prepare and eat their meals during the business day, so it’s important to keep the space clean and sanitary. Not only is a clean break room a safety necessity, it will also improve the comfort and morale of your team. These tips will help you stay on top of the job. Keep the refrigerator clean and organized. This can be accomplished by imposing a weekly disposal day. Notify all colleagues that every Friday near closing time, all items in the fridge will be tossed out unless otherwise marked. After disposing of expired items, wipe down the interior of the appliance with hot soapy water, then wipe down again with clean hot water. Every day, at the completion of the last lunch break, wipe down the counters, chairs, tables and sinks with a clean cloth and disinfectant spray. Wipe down the interior and exterior of the microwave on a daily basis, too. 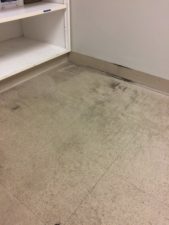 Remnants left throughout the day from employee after employee heating and reheating their meals can leave a residue that can foster mold growth. Use hot soapy water for the initial wipe down, then wipe down again with clean hot water, then dry wipe with a clean cloth. Dishes should be washed, hand-dried and stored appropriately after each use. 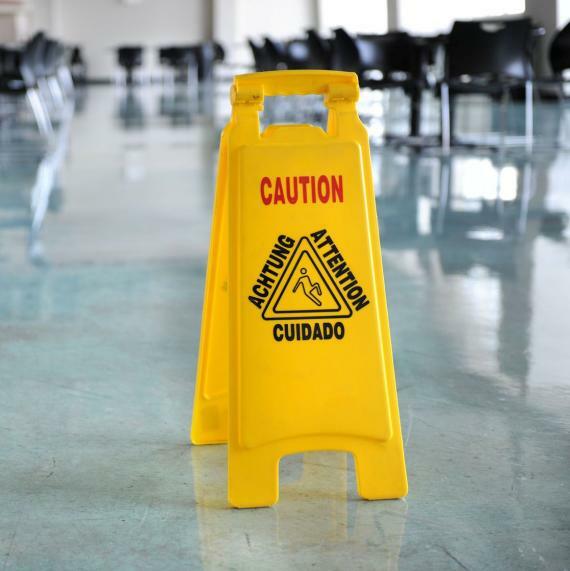 Any spills on should be cleaned up immediately and the surface dry-mopped with a clean cloth. Keeping your break area well-stocked with cleaning supplies will help your team stay on top of maintaining this common space. If everyone feels like they’re benefiting from a clean kitchen, everyone will do their part to help keep it that way. Consider placing one or two people in charge of completing the daily maintenance tasks and rotate the responsibility on a convenient schedule. 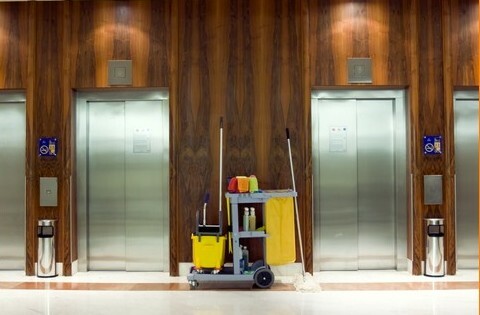 It’s also a good idea to have your break room or kitchenette thoroughly cleaned on a regular basis as part of your overall office cleaning services. This includes wiping down the cabinets and surfaces, as well as sweeping and mopping the floors. These routine cleaning services will keep pests away and ensure your colleagues have a break room they feel comfortable dining in. Your service should begin at the sidewalk. Keeping walkways swept clean and free of any litter helps project a positive image. Trash sitting in front of a building just looks bad. 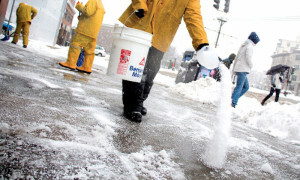 To prevent overflow, outside waste receptacles should be emptied frequently and wiped clean periodically. This will actually help trash find its way into the container. If an area is kept clean, more people will pitch-in to keep it that way. The most important aspect of a lobby is still the windows. 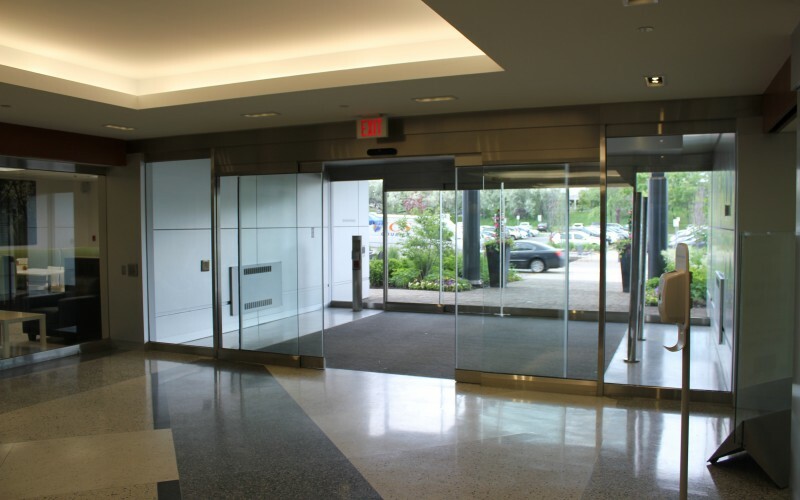 Cleaning interior glass is a daily task that goes without saying, but to provide the most professional service, we wash and squeegee the exterior glass on a regular basis. This will keep the windows looking their best. Interior windows wont get dirty as quickly so using a squeegee for them on a monthly basis should be sufficient. Dusting around ceilings, window ledges, and baseboards of the lobby is a must. Focus on cobwebs and insect matter that may have accumulated since the last cleaning service. This is not something we want to leave visible in the entrance to one of our buildings. Wipe down the furniture and also be sure to straighten up the magazines. This goes a long way in presenting a clean and organized atmosphere. Sanitize door handles, telephones, and other high-touch points to keep germs at away. The final step is cleaning the floors. Thoroughly vacuum the mats, roll them up, and remove. Sweep the floor, making sure to get edges and corners. Mop with a fresh scented neutral cleaner and scrub/buff where applicable. Replace the mats only after the floor is completely dry. Following these guidelines will ensure you present the best possible image for the building that you clean. Are you still using traditional cotton string and ring-out mop heads? Well there’s a better way to clean floors. The latest microfiber technology can help make cleaning your home or office easy and mopping the floor more efficient. Microfiber mops are light-weight and easy to maneuver around furniture and obstacles. There is no need for wringing out or water changes. The flap mop sweeps as it goes and gets into corners well. This makes cleaning the floor a snap! It’s recommended to use a fresh mop head for each room. This prevents cross-contamination from the bathroom to the kitchen and so on. Place several of the mops in a microfiber mop bucket and fill it half way with water and the cleaning product of your choice. Put the lid on and turn the bucket upside down. After a few minutes of soaking, the mops are ready to use. Attach the quick release mop handle and you’re all set. Have a plastic bag handy to put the used mops in. When you’re finished, just toss the mops in the wash and they’ll be ready for the next time you clean your floors. 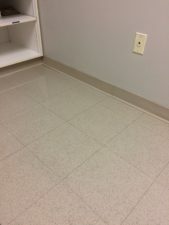 Microfiber is a great way to achieve clean floors you can be proud of. We suggest you try them out. 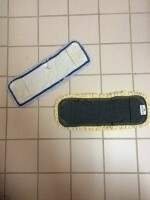 We use microfiber mops for many applications, even for applying floor finish!